A Russian warship sailed through the Bosporus on Sunday with a soldier holding a shoulder-fired surface-to-air missile on the deck throughout the journey. “The Russian ship’s passage with a soldier showing a missile is nothing but provocation. Hopefully it is an isolated incident,” Çavuşoğlu told reporters in the southern province of Antalya. He said the rules regulating passages of ships through the Turkish Straits are clear and warned that Turkey would give the “necessary response” when a threatening situation arises. 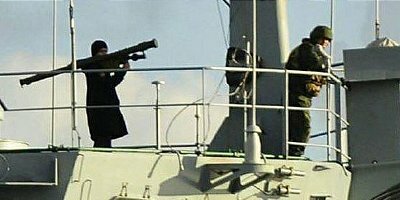 Photos of the Russian soldier holding the missile on his shoulder, ready to fire, throughout the ship’s passage through the Bosporus were circulated on social media. The passage of the Russian warship through the Turkish Straits comes amid escalating tension between the two countries after Turkish F-16s downed a Russian Su-24 near the Syrian border. Turkey said the plane was downed because it violated the Turkish airspace while Russia denied violation and vowed serious consequences. As Turkish-Russian tension continues, a group of NATO warships have also arrived in İstanbul, anchoring off Sarayburnu coast on Sunday. The Standing NATO Maritime Group One warships consists of Portugal’s F-334 NRP Francisco de Almeida, Spain’s F-105 ESPS Blaz de Lezo and Canada’s FFG-338 HMCS Winnipeg.